Check out our gallery of yin yang tattoo ideas! Yin Yang tattoos pack a lot of ancient Chinese philosophy into a few square inches of skin. Learn about the extraordinary symbolism behind this extremely popular example of body art. Yin Yang tattoos immediately evoke thoughts of how opposites attract. The traditional design is circular, with a dark half and a light half that fit together like pieces in a puzzle to form a single whole. Yet these light and dark halves are not mutually exclusive of each other. Each half has a drop of the other's color in it, symbolizing that in the light, there is still a tiny patch of darkness and that in the dark, there is still a ray of light.This is the crux of the ancient Chinese philosophy about the duality of the universe. Opposites come together to balance the entire universe, to bring harmony. As mentioned earlier, the classic design of Yin Yang tattoos is the interlocking circle of light and shadow. This design can be very simple as shown above, but many artists take greater license with the design to make it more original while still keeping the true essence of its meaning. Kanji also has numerous symbols that fit the Yin/Yang concept. These might be used either on their own such as the symbol for Zen or the individual symbols for Yin and Yang, or in combination with each other, such as the symbols for man and woman or good and evil. Approaching your tattoo this way leaves a lot of room for personal interpretation and creativity, while still expressing your views about the attraction between opposites. 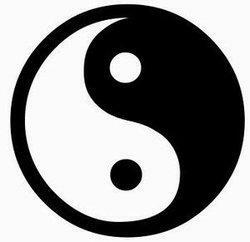 Although the two halves of the Yin Yang are equal, some people feel there is a definite way the symbol should be displayed. Light, or sun, generates energy and heat. Dark is the absence of energy so it's cold. If you espouse this theory, then the "head" of the light half should be at the top of the design because heat rises. It follows that the "head of the dark half should then be at the bottom of the symbol because cold drops. That said, you'll find examples of the symbol displayed with the halves placed at just about any degree on the compass. Chalk it up to artistic license, but as long as the owner of the tattoo is happy with his/her artwork then that's all that really matters. 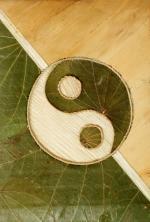 Masculine and feminine, light and shadow, Heaven and Earth; all of these concepts are encompassed in Yin Yang tattoos. The design is about the very duality of nature itself and how one side must be completed by the other to achieve ultimate balance and harmony. There's no doubt about it, these tattoos express a profound sense of spirituality.